A patron exits a Circuit City store on March 14, 2005, in Manassas, Va. There is no mystery as to why the No. 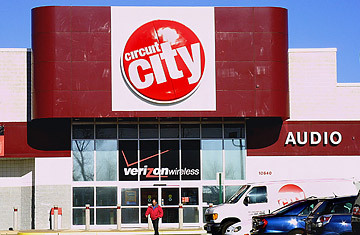 2 electronics retailer in the U.S., Circuit City, filed for bankruptcy on Nov. 10. You could blame it on the bad economy or decreased consumer spending  which played no small role  but the real culprit is good old-fashioned bad management. The silver lining  for consumers anyway  may be discounted goods at the 155 outlets that the chain announced late last week it would close. JPMorgan's Christopher Horvers reported flush inventory and 10% off everything from TVs to notebook computers. Good luck finding a salesperson.